The symbols they used throughout time were usually of serpents or dogs. Physically, as a generality, the Sirians had darker skin, darker hair and eyes, and were not as large as the Lyrans. As far as their personality characteristics, we would say that they were very devoted to serving mankind. Whereas the Lyrans were committed to ruling mankind, the Sirians were interested in helping or sometimes even saving mankind. They could be very, very zealous, and because of that trait, they often interfered where they did not belong. But you could say they were the crusaders for mankind. Sirians are principally benign, or Service-to-Others. They have been involved, from time to time, in Earth’s history, and therefore take an interest in their handiwork. As with all alien groups, there are some members who are Service-to-Self. These numbers are small in proportion to the membership choosing the Service-to-Others orientation. Likewise with the Pleiadeans and Nordics. They are a watery, dreamy race who are basically an evolved version of dolphins and whales, somewhat. They are said to live in the Christ consciousness, and are in a solar system very linked with our own in a psychic manner. They too play a role in helping Earth, but they are doing it from a more subtle standpoint, like through the cetaceans in our seas. The Sirians are a people whom assist Earth and its inhabitants. The Sirians are considered to be ‘Spiritual Warriors’ and are more spiritually advanced than most civilizations. They originate from a double star in the constellation Canis Major, or Orion’s Dog. Sirius A (of Sirius A & B) lies only 8 light years away. They appear human, and are distant relatives to us. Though, they are much more evolved technologically and spiritually than us. 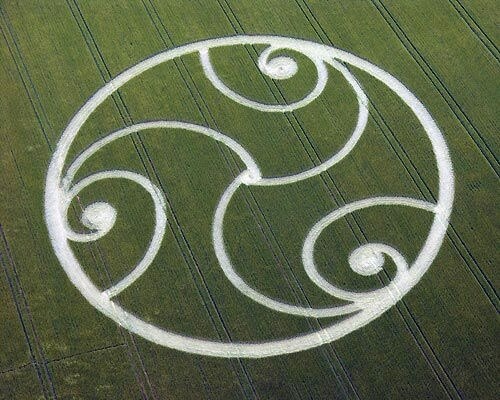 Here is a crop circle of their star system.